Joan Mwangangi set to receive college scholarship and vie for regional title this summer. Selected among a number of outstanding youth, Joan Mwangangi has been named the Texas Youth of the Year by Boys & Girls Clubs of America. The Youth of the Year title is a prestigious honor bestowed upon an exemplary young person in recognition of leadership, service, academic excellence and dedication to live a healthy lifestyle. Now in its 72nd year, the Youth of the Year program honors our nation’s most awe-inspiring young people on their path to great futures and encourages all kids to lead, succeed and inspire. 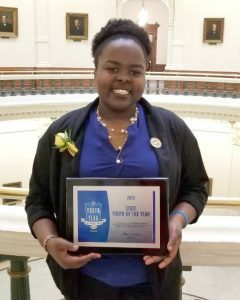 As the Texas Youth of the Year, Mwangangi has consistently taken stake into her Club, which she has been a part of for seven years. In will serve as an ambassador for all teens in the state, will receive a $5,000 college scholarship from Boys & Girls Clubs of America, and will go on to contend for the regional Youth of the Year and ultimately the national title. Mwangangi has consistently taken stake into her Club, which she has been a part of for seven years. In addition to volunteering and co-organizing fundraisers, she is also the president of the Keystone Club, a teen group dedicated to leadership and community service. As a Club member, Mwangangi has taken part in numerous programs offered by the Boys & Girls Club but has been drawn especially those with health and wellness focus. With her eyes set on a degree in kinesiology, she understands the need to live a healthy lifestyle that takes eating right and daily exercise into consideration. Founded more than seventy years ago in 1947 as Boys & Girls Clubs of America’s premier youth recognition program, Youth of the Year recognizes outstanding contributions to a member’s family, school, community and Boys & Girls Club. The Youth of the Year recognition program is presented by The Walt Disney Company, who has supported Boys & Girls Clubs of America for more than 50 years, empowering young people to reach their full potential and providing youth with access to the tools they need to build the great futures they imagine. Toyota is the Signature Sponsor of the national Youth of the Year program. This summer, Mwangangi will join other state winners to vie for the Southwest regional title. If named the regional winner, she will be awarded an additional $10,000 college scholarship, renewable for four years up to $40,000. Six youth, including five regional winners and a military youth winner, will advance to Washington, D.C. in September 2019, to compete for the title of Boys & Girls Clubs of America’s National Youth of the Year. The National Youth of the Year will receive an additional scholarship of $25,000, renewable for four years up to $100,000. For more information about the Youth of the Year program, visit www.youthoftheyear.org.